Hop in a canoe or single kayak and get ready to explore Whistler’s famous River of Golden Dreams. With epic views around every bend, the River of Golden Dreams features lush, old growth forest and wildflower-lined banks, as well as stunning snow-capped mountain vistas. 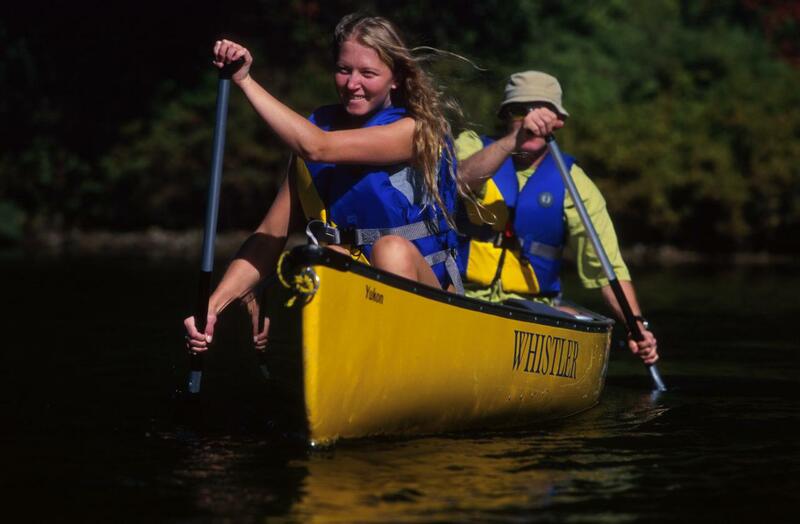 Let experienced guides give you paddling tips while sharing their knowledge of Whistler’s fascinating history, geography and wildlife – or head out on a solo tour. At the end of your scenic excursion, we shuttle you back to Whistler Village or Lakeside Park. This is truly a trip you don't want to miss. It is Whistler's original and most popular summer activity. You can’t say you’ve been to Whistler until you’ve paddled the River of Golden Dreams. Guests opting to go Self Guided should have moving water paddling experience. We offer guided trips for guests who do not have moving water paddling experience. * Please note that you will have a scheduled pickup time at the end of the river, depending on your departure time. You MUST be at the end of the river for your scheduled pickup time as your boats are booked again immediately after. Extra charges will apply to those who miss their pickup time. * Children under 12 are $42.00 only when sitting in the middle of a canoe with 2 adults. Bookings are accepted outside of 24 hours only. If you would like to book within 24 hours please call for availability at (604)-932-3111 and we will do our best to accommodate you. Youth aged 12-17 are eligible for 15% discount on our 9:30 am departures only. Discount will be applied on arrival when requested. If you have a group of 12 or more please contact us at 604-932-3111 so that we can accommodate you. Save 15% on your online booking by using Promo Code Promo19UG. Discount applies for a limited time only. Discount applies to Adult rates only, as children are already discounted.